Malic Acid, Natural & Artificial Flavors, Silicon Dioxide, Sucralose, Acesulfame Potassium (Ace-K), Maltodextrin. Natural & Artificial Flavor, Citric Acid, Silicon Dioxide, Sucralose, Acesulfame Potassium (Ace-K). Silicon Dioxide, Natural & Artificial Flavor, Citric Acid, Sucralose, Acesulfame Potassium (Ace-K). Sucralose, Acesulfame Potassium (Ace-K), Citric Acid, Malic Acid, Natural and Artificial Flavors. This product was manufactured on equipment that process products that may contain milk, egg, soy, tree nuts, peanuts, wheat, fish, crustaceans, & shellfish. Citric Acid, Natural & Artificial Flavors, Sucralose, Silicon Dioxide, Acesulfame Potassium (Ace-K), Maltodextrin. Citric Acid, Natural and Artificial Flavors, Sucralose, Silicon Dioxide, Acesulfame Potassium (Ace-K), Maltodextrin. Malic Acid, Natural & Artificial Flavors, Citric Acid, Sucralose, Silicon Dioxide, Acesulfame Potassium (Ace-K), Maltodextrin. Nov 06, 2014 MAN Sports ISO-Amino – Candy-Flavored BCAAs, Nothing Else! 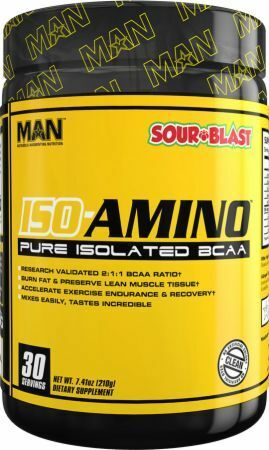 MAN ISO-Amino has been announced. They are claiming a BCAA product with *nothing* but the BCAAs, and the best flavors available!